SoftPerfect Network Scanner is a portable IP, NetBIOS and SNMP scanner that supports remote shutdown and Wake On LAN. It was created for system administrators and users who are interested in heightened computer security. 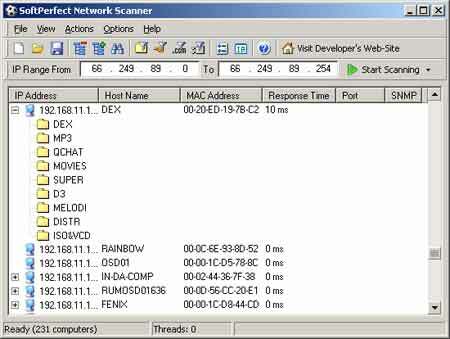 The Network Scanner pings computers, scans for listening TCP ports and can display any resources that are shared on your network. SoftPerfect also allows you to mount shared folders as network drives, check for a user defined port and report back if one is open, resolve host names and autodetect your PC’s local and external IP addresses.